Most of us are probably familiar with the 1995 epic movie Braveheart, with Mel Gibson. That movie is probably what first comes mind when we mention the name of William Wallace. He was a Scottish knight who became one of the main leaders during the wars of Scottish independence from England at the end of the 13th century and beginning of the 14th. William Wallace won the important Battle of Stirling Bridge against the English army on September 11, 1297. After that, he became Guardian of Scotland until his defeat at the Battle of Farkilk in 1298. Some years later, in 1305, they captured and executed him. The painting by Daniel Maclise represents the trial, which took place on August 23, 1305. Although the title in the box is Trial of William Wallace, the true title of the painting is Wallace’s Trial in Westminster Hall. They charged him with high treason and crimes against English civilians. As soon as the scene in the painting concluded, they hanged him. However, they released him while he was still alive. Then, they emasculated him, eviscerated him, and burned his bowels before him. Finally, they beheaded him and cut him into four parts. They placed is head on a pike atop London Bridge. His limbs were displayed, separately, in Newcastle, Berwick, Stirling, and Perth. It seems like they did want to send a strong message. As we can see in the picture, he has a garland of oak as a crown, to signify that he was the king of the outlaws. His figure is big and dominates the scene. His bold countenance aligns with his response to the treason charge: “I could not be a traitor to Edward, for I was never his subject”. The puzzle is very nice, with a lot of variety and detail. If I recall well, it was not very difficult and it was a pleasure to assemble. Unfortunately, it was incomplete. That’s what often happens when buying used puzzles. For that reason, it is now added to the Missing Pieces section and it is available for replacements. 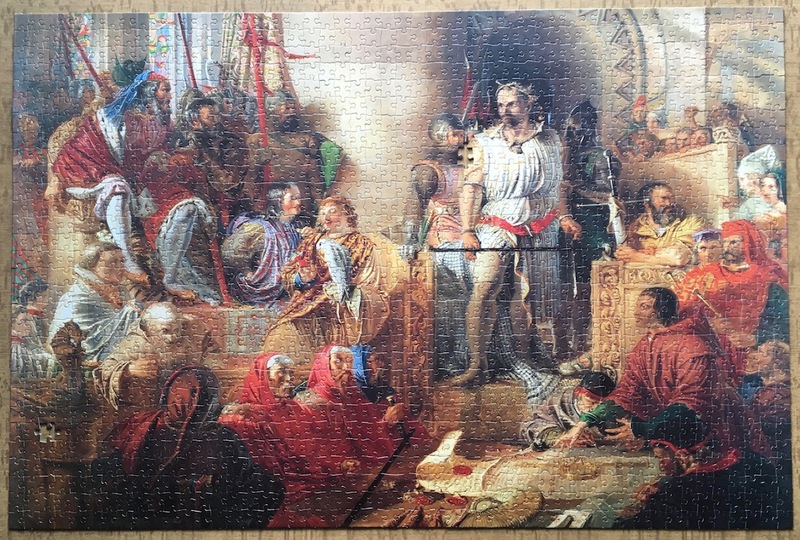 There is another very interesting puzzle with a painting by Daniel Maclise: Robin Hood and His Merry Men Entertaining Richard the Lionheart in Sherwood Forest. 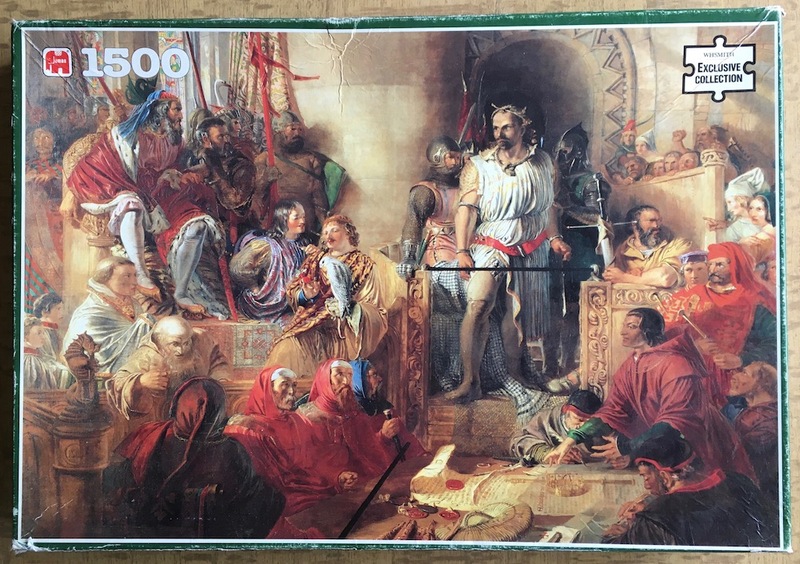 1500, Jumbo, Trial of William Wallace, Daniel Maclise, 90 x 60 cm, Reference Number 80076. Previous Post	Should I Buy Insurance when Shipping my Puzzles?